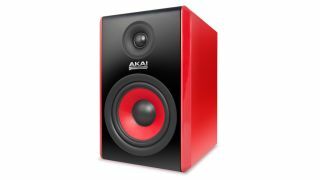 Akai has unveiled two new sets of studio reference monitors, the RPM500 and RPM800. Both monitors come in eye-catching, reinforced red cabinets and offer distributed Class A/B amplification. According to the company, both sets of monitors have been designed in order to "handle extremely busy modern mixes with ease, allowing you to mix tons of layers with clarity and precision." Both the 90-watt RPM500 and the 120-watt RPM800 are due to arrive in October, priced at $599.99 and $799.99 respectively. Check out the press release below for full details. Available in stores in October, Akai Professional's newest studio reference monitors, RPM500 and RPM800, offer meticulous reproduction of even the most complex modern music with the perfect balance of finely tuned technologies. Both offer distributed Class A/B amplification, providing ultra-efficient power while ensuring minimal distortion. RPM500 provides 90 Watts total, with 50 Watts dedicated to its 5 ¼-inch woofer and 40 Watts to its silk-dome tweeter; RPM800 offers 120-Watts total, with 80 and 40 going to the woofer and tweeter, respectively. "People need to hear these. Talking about how good they sound is one thing, but to hear them—and feel them—then people get it," said Dan Gill, Product Manager, Akai Professional. "These speakers offer absolute precision when producing and mixing music. It's authoritative and clear, which is exactly what producers need to mix with confidence." While RPM500 and RPM800 are bold in both appearance and sound, it's what goes largely unseen that contributes to the well-balanced tone and presence of the speakers. Each cabinet is painstakingly reinforced to minimize flex, combating unwanted coloration while preventing anomalies and sound artifacts from polluting the mix. Radio frequency protection and magnetic shielding are integrated into the cabinets to preserve signal purity along with robust 14-gauge wiring to the transducers. The flared rear-firing bass port delivers low-frequency depth and definition, while a dedicated Proximity Control allows for precise low-end tailoring. "One of the major factors that contributes to the clarity of these speakers is their Kevlar cones, which are super-agile—meaning the low-end has a tight and responsive sound rather than the floppiness experienced with other speakers," said Gill. "RPM500 and RPM800 can handle extremely busy modern mixes with ease, allowing you to mix tons of layers with clarity and precision." RPM500 and RPM800 include a monitor isolation pad to dramatically decrease structure-borne resonances and noise. Additionally, both feature HF Trim, Mid-Range Boost, LF Cutoff controls, plus XLR, balanced ¼-inch TRS, and RCA inputs.